Mage, Minions, Treasure Hunter, Towering Terrazon, attacks with a Fire Sigil, Stonescar Maul or Piercing Shot, each and every scene is easy to express with the generous compliment of natural and designed sounds in AAA Card Game. 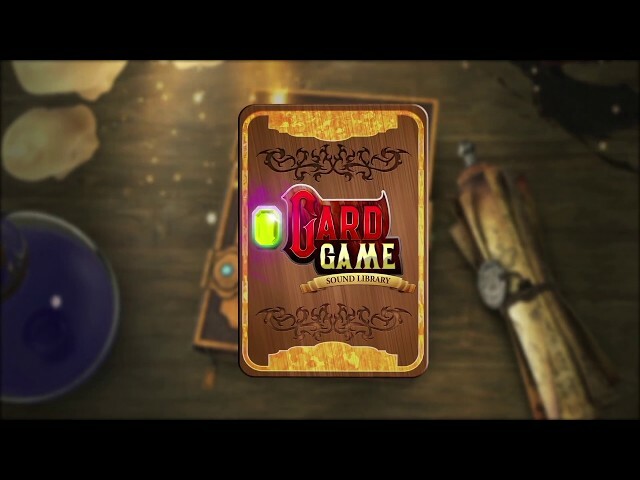 The library is organized into popular categories that make it easier to create an outstanding card gaming experience: User interface, HUD, transition and lobby sounds, card movements, game plays, game magic, spells, casts, alerts and achievements, upgrades, shuffles, timers and character/card abilities. Even more, the sound library includes ambience loops and a total of 20 minutes lapsed time of production ready audio. Game dev newbies and veteran sound designers, audio supervisors and remix engineers can stack the deck for producing the audio in their next game release. With AAA Card Game you’ll take advantage of our multiple foley sessions and months of post production sound design to bring you this jam-packed collection of sound effect gems. You’ll get your project done in no time at all and who knows, …you could even get a raise!